A South Dakota adventure is not complete without exploring the awe-inspiring Badlands National Park. Millions of years ago, ancient animals like early horses, rhinos, saber-tooth cats, and alligators called the Badlands home. Native Americans have long used the Badlands as a hunting ground. 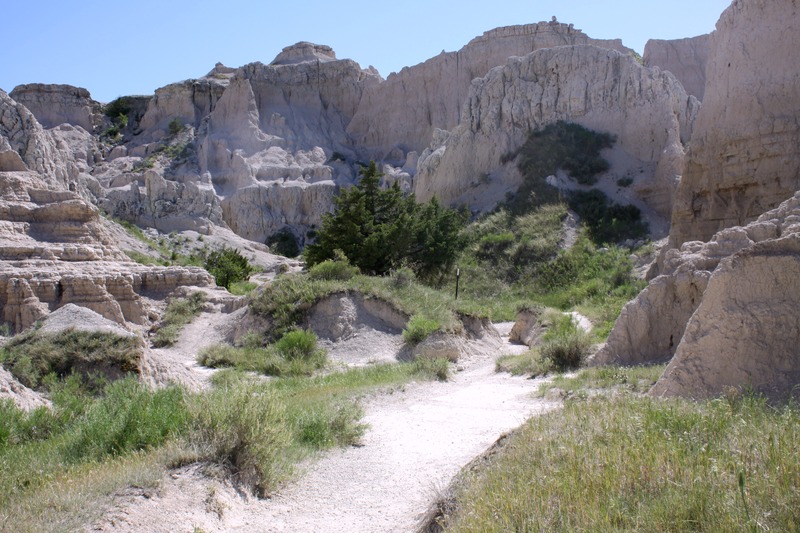 Lakota Native Americans even found fossilized seashells and turtle shells and correctly theorized that the Badlands had once been underwater. Today, you won’t find any alligators in the park, but you may catch a glimpse of local wildlife such as bighorn sheep, bison, prairie dogs, and the rare black-footed ferret. Black-footed ferrets once numbered in the thousands but were brought to the brink of extinction in the 1960s due to habitat loss and disease. In 1979, they were declared extinct until a small group of ferrets was discovered by a rancher in Meeteetse, Wyoming. They were then reintroduced into several areas, including the Badlands. When hiking in the Badlands, remember to bring water and sun protection, wear appropriate footwear, and stay a respectful distance from wildlife. A good rule of thumb — if wildlife is reacting to your presence, you are too close! The Notch Trail goes from the Door/Window parking lot and through canyons to a log ladder. After climbing the ladder, it follows along the edge of the canyons to a ledge with a fantastic view of the White River Valley. The trail can be difficult due to the steep ladder and the drop-offs. The Medicine Root Trail gives hikers the opportunity to see the prairie environment in the park. It is a moderately strenuous hike. Watch out for cactus! The Cliff Shelf Nature Trail is a short trail over a boardwalk but gives hikers an opportunity to see local wildlife and a great view of the White River Valley and Eagle Butte. Over 50 plant species and 100 bird species have been seen in the area around the trail, partially due to the Cliff Shelf’s bowl-like shape retaining more water. There is occasionally a small pond that attracts wildlife such as bighorn sheep. Keep your binocular handy and get hiking! The Fossil Exhibit Trail is a great hike for children. The trail features short plaques that describe the animals that used to inhabit the park and bronze casts of fossils and impressions. The trail is on a boardwalk, but hikers are allowed to go off the trail and explore. Looking for a challenge? Try the longest trail in the Badlands. The Castle Trail begins at the Door/Window parking lot and travels through the Fossil Exhibit Trail. 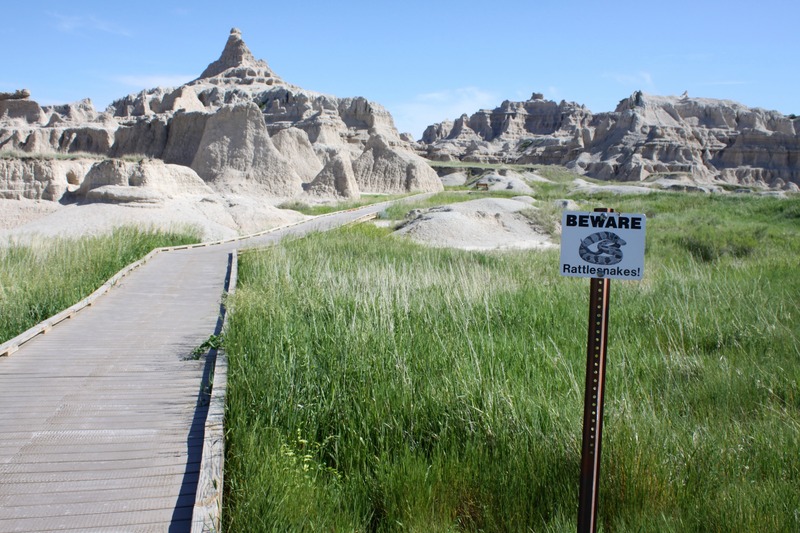 Hikers will get to see a variety of Badlands formations. The hike is long but fairly level.